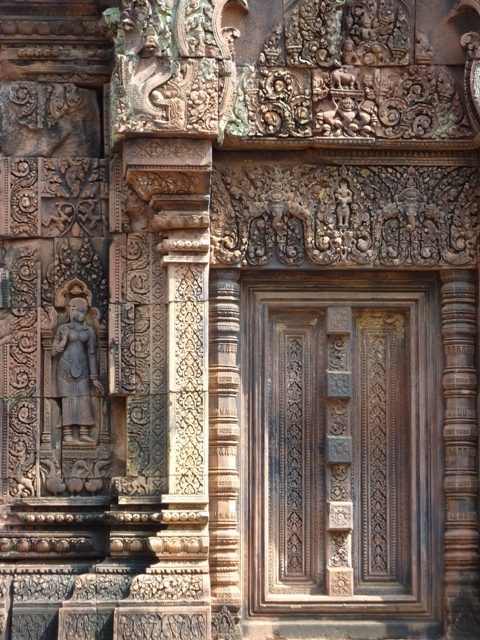 Banteay Srei is the exquisite and quite compact pink sandstone temple that sits about 30 kilometres away from the main temple of Angkor Wat. It was constructed as a religious retreat by a Hindu priest called Yajnavaraha, spiritual advisor to the King. 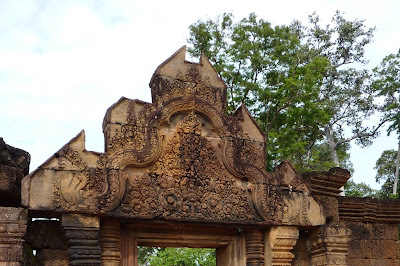 It is a beautiful thing, its intricate carvings quite well preserved, and its interior sacred space still palpable in a strange way, surrounded by carved stone monkey protectors, garudas and demons. It takes the best part of an hour to get to Banteay Srei by tuk tuk from Angkor Wat, but it is well worth the trip. 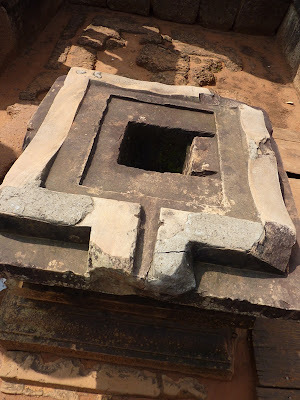 Some tour providers will tell you that it is not possible to visit the two sites in the same day, but I have done so many times, and if you are time poor it is perfectly possible to see the highlights of the Angkor area in one day. 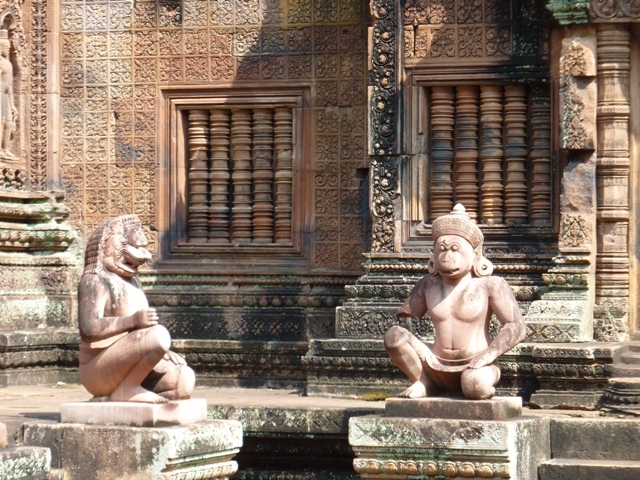 These days Banteay Srei is in a very well-kept tourist area, and there is coffee available there, as well as a whole complex of tourist shops. Bargain hard, and good luck, because the sellers are quite ferocious. There are also a couple of quite good restaurants on the site, and it is well worth eating there, as they supply some quite good Khmer food - I recommend the Khmer noodles with a mild green curry, served with a bunch of exquisite fresh herbs foraged in local forests. I'm not sure there is a particularly goood time to go to Banteay Srei. I have been at all times, and there has always been a dense crowd of tourists. It can actually become quite claustraphobic inside the temple complex because of the heat, the sun, and the heavy press of tourists. And God help you if you arrive at the same time as a busload of travellers from mainland China. But you can deal with tourist crowds in a polite but assertive way. Just be prepared to push and shove, in a gentle and polite fashion, and don't get all angry if someone is standing in your way. They're on holiday too and have just as much right to take in the sights. And if someone shouts at you because you got in the way of their photo, just ignore them - they're being a dickhead.